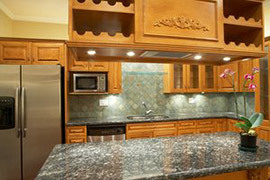 When we are designing the lighting for a kitchen we always include under-cabinet lights. Under-cabinet lights provide task lighting on the counter tops that complements the overhead lighting we install over the work spaces and dramatically reduces shadows in the work space. These lights also double as ambiance lights at night as the light brightens the backsplash and enhances its appearance. My clients are often surprised to find out that fluorescent lights are my favorite of the three. When most of us think of fluorescent lights, we think of the buzzing, flickering, fading bulbs we’ve seen in years past. Like a lot of things, technology has made fluorescent lights much better. The compact lamps can be concealed easily, there are choices of the light hue that can be made, they come on instantly, and they don’t flicker, buzz or hum like the old school ones did. The bulbs come in a wide variety of lengths so it’s easy to get full coverage without leaving dark spots or light gaps. Along with bright uniform lighting, the bulbs have long life spans. There are a wide variety of incandescent under-cabinet lights, with halogen and xenon and puck lights being the most popular. Those who like these lights do so because the light tends to be a cooler white—less yellow—and the bulbs tend to be inexpensive. The downside is that the life span of the bulb is about a third of the fluorescent lights, and my biggest pet peeve is that the incandescent lights throw off a bunch of heat. Some of the manufacturers of these lights don’t recommend putting food on the first shelf because the heat from the incandescent lamps will cook it! It also takes a bunch of incandescent lights to get even lighting. More lights, more heat. LED lights are becoming more and more popular because of their low energy use and long life, and they’re cool looking and can be used in a wide variety of creative ways. LED lights don’t typically just burn out; they fade or put out less light over time and become dim. LED lights are susceptible to heat; the bulbs will not last as long if they are constantly subjected to heat, like from a stove, coffee pot or toaster. The biggest downside is that they are expensive, and expensive to install. The technology is relatively new and improving. 1. Uniformity of lighting. Having even light over the counter and backsplash looks much better and functions better as task lighting. 2. Having enough lighting. Wimpy looking under-cabinet lighting can look distracting and not give you the safety of a well-lit area. Sometimes doubling up on the lighting can make sense. 3. Buy the best quality fixtures and have them professionally installed. Under-cabinet lighting is expensive. Professionally installed, it can cost between $50 and $100 per foot. A do-it-yourself budget job with budget fixtures might be half that, but, if it looks bad and doesn’t function well, was it worth saving the few hundred dollars? Posted with permission from Mike Medford. Originally published at http://askmikeabouthomeremodeling.com/2013/06/05/under-cabinet-lighting/. See more of Mike’s blogs at http://www.mikemedford.com/.